Before the serial publication of Crime and Punishment in the prominent literary journal The Russian Messenger in 1866, the reception of Fyodor Dostoevsky’s works, and his reputation as a writer, had been somewhat mixed. The story of his career marks one of the most dramatic falls from grace in literary history. His first original work, the novel in letters Poor Folk, was lauded by critics and read avidly by an educated public eager for new voices when it appeared in 1846. But the novella The Double, published barely six weeks later, was met with blank incomprehension, ridicule, and barely veiled accusations of plagiarism. Many of his other early works, from the slight and sentimental ‘White Nights’ to the overblown gothic, psycho-sexual drama ‘The Landlady’, fared little better, and even today such texts often meet with sceptical responses. This faltering career was abruptly interrupted in 1849 by the author’s arrest on charges of sedition — in actuality involving little more than membership of a moderately socialist philosophical discussion circle, but sufficient to warrant harsh punishment under Tsar Nicolas I’s authoritarian rule. After serving a four year sentence of hard labour in Siberia, followed by several more years in exile, Dostoevsky returned to St Petersburg at the end of the 1850s and recommenced his literary career. Initially the results were similarly mixed. Texts that are now considered highly influential – Memoirs from the House of the Dead, for its original depiction of Russia’s peasant convicts, and Notes from Underground, for its polemic with the new generation of radicals, did not enjoy the level of success the author hoped for. Everything changed with Crime and Punishment. This was the novel that finally established Dostoevsky’s reputation in the eyes of the reading public of nineteenth century St. Petersburg and that turned him into the novelist we still read, debate, and translate today. What is it about Crime and Punishment that sparked off this transformation from intermittent success to literary giant? I think various factors within Dostoevsky’s intellectual, literary, and physical environment – past and present – came together to create one of the world’s greatest novels as well as inspiring his other works. Tala Birell and Douglass Dumbrille in Crime and Punishment (1935): Publicity still via Columbia Pictures. Public Domain via Wikimedia Commons. 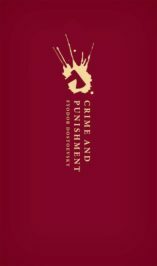 The first clue lies in the title: Crime and Punishment reflects a new trend among the major novelists who had established their reputations in Dostoevsky’s absence from the literary scene to base their texts around the opposition of grand themes. Turgenev’s Fathers and Sons (1862) was Russian literature’s first significant foray into the ideas of the young radicals, the so-called nihilists. Tolstoy’s War and Peace (1865-9) was already being published in serial form in The Russian Messenger when Dostoevsky began planning Crime and Punishment, and throughout 1866 the two works appeared together in the journal. To this tension between opposing ideas Dostoevsky added a new element: the murder plot, which was in fact not part of his original plan. This contributed to the novel’s appeal in two ways. Firstly, turning it into a “why-dunnit” made it a real page-turner. Secondly, it allowed him to introduce the figure of the detective Porfiry Petrovich (who much later became the model for the TV detective Columbo). Following reforms to the Russian judiciary in the early 1860s that created detective roles for the first time, the detective genre was gaining popularity in the pulp fiction of the day. Indeed, half the characters in Crime and Punishment appear to want to be detectives, and are intent on uncovering the murderer themselves. For Dostoevsky, bringing in elements of popular and genre fiction henceforth became a fundamental part of his literary method, but arguably his first sustained attempt at this, in Crime and Punishment, was his most successful – perhaps because the murder here stays centre-stage for the whole novel. The murder plot and decision to focus the novel so closely on the consciousness of the murderer (Dostoevsky initially planned it as a first-person narrative) undoubtedly originated in the insight the author gained into criminal minds whilst serving his sentence in the prison camp in Omsk. There, as House of the Dead makes clear, he encountered some of Russia’s most violent and depraved convicts, including men who murdered children for the sheer pleasure of it. Such horrifying characters may well have inspired some of Dostoevsky’s most memorable amoral characters, including the libertine Svidrigailov in Crime and Punishment. But his anti-hero Raskolnikov is certainly nothing like this. Cold-blooded he may be, but he is also remarkably inept, and, however much he wishes to deny it, is assailed by his conscience after the fact, which makes him curiously sympathetic. Yet his insight into criminal psychology was not the only thing Dostoevsky took away from his prison experience and translated into Crime and Punishment. Two other factors proved key to the arguments he developed in the early 1860s against the ‘nihilists’ who wished to remake society along rational lines. The first was the understanding of the centrality of liberty to the human psyche. The convicts he observed would do anything – even harming themselves – to prove they retained their inner freedom. This insight became crucial to the narrator’s polemic against his rational opponents in Notes from Underground. In Crime and Punishment, we see the other side of the same coin, relating to the second question: what happens when that desire for freedom is unchecked. This is something that in House of the Dead is associated not with the convicts but the jailers, some of whom take a grotesque pleasure in punishing their charges – the flogging of peasant convicts was still ubiquitous, and frequently led to their deaths. These executioners who had lost their moral compasses in pursuit of their power over others and of the ‘art’ of flogging may seem a long way from Raskolnikov’s murder for supposedly ideological ends. Yet at their heart they have the same problem: the assumption of superiority over others, the reduction of human beings to abstractions that can be dispensed with in order to achieve any goal, and a focus on ends rather than means. Perhaps the final factor that brought everything together was the novel’s setting, around the Haymarket in St. Petersburg, where the grandeur of the imperial capital gives way to poverty, squalor, and vice. The city here is not merely a backdrop, but reflects the imposition of the will of one man, its founder Peter the Great, who famously decreed its existence and oversaw its building, which cost the lives of thousands of slaves. In Notes from Underground the narrator describes St. Petersburg as ‘the most abstract and premeditated city in the whole wide world’ – again alluding to that problem of abstraction and its potential to elevate ideas over lives. In this most ideological and willed of cities, the most ideological and willed of murders seems bound to happen. Crime and Punishment embodies the spirit of St. Petersburg to the extent that the character of Raskolnikov seems willed into existence by the city itself. Dostoevsky’s own dramatic life and rejection of the radical ideas of his youth led him to discover this combination. It produced a novel that still speaks to us as strongly today as it did when it was first published 150 years ago. Featured Image: “St Petersburg Russia Sunset” by LuidmilaKot. CC0 via Pixabay.